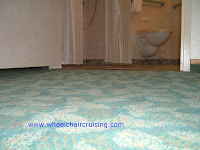 Why Not Talk Cruise .... About Accessible Seas! I’m very excited and am planning my Friday afternoon around a radio show! Royal Caribbean International has been hosting a show, “Why Not Talk Cruise” on the online radio station, The VoiceAmerica™ Talk Radio Network for a few months on Friday afternoons at 2:00 EST. I’m excited because this Friday’s (7/24/09) episode is devoted to “Accessible Seas!” The show’s guest will be Jean Driscoll, a Para-Olympian and godmother to Mariner of the Seas. I'm anxious to hear anything new that will be announced. I bet one topic of discussion will be the world's largest cruise ship (46 of her cabins will be accessible! ), Oasis of the Seas which starts sailing this fall. You can catch the show live at http://www.modavox.com/voiceamerica/vepisode.aspx?aid=39962 . The show will be archived on that site in case you miss the live episode. If attending live, click on "Channels" at the top and then on "Why Not Talk Cruise." Since our company’s inception, we have provided services like oxygen, wheelchairs, scooters, power chairs, walkers and other specialty equipment to thousands of individuals so that (1) travel can be a reality and (2) travel experiences would be more enjoyable and comfortable. Without knowing about companies like Special Needs at Sea, individuals who are disabled and slow walkers (people who require assistance walking with speed or distance but do not consider themselves disabled) are often daunted by travel. We have eliminated the hassle caused by lugging devices on planes or cars. We have eased the minds of people worried that their scooters or other mobility equipment will come off airplanes broken or damaged. 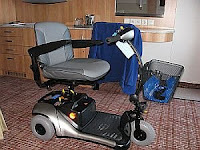 Our specialty equipment is waiting in cruisers staterooms, at the hotels or wherever the individual needs it. We also make travel a reality. Disabled travelers and slow walkers often believe that their only option is staying at home and that traveling is no longer an option. We have made travel possible for cancer survivors, individuals with hip replacements and individuals who have been prescribed oxygen. Plus, with families now living all around the world, we have made it possible for everyone to enjoy weddings, reunions, meetings and religious gatherings. Similar to that woman I met at the gas station, our goal is to make sure family and friends with special needs are safe, healthy and able to enjoy life. Special Needs at Sea delivers an accessible world. P.S. For examples of equipment available for rent, visit our WheelchairCruising's Equipment Rental page. Connie George Travel Associates is happy to assist you with renting equipment which can make your cruise more enjoyable and comfortable. For further information regarding Special Needs Group / Special Needs at Sea, visit http://www.specialneedsgroup.com/ .